Travel, tour and explore Land of Hornbills (Bumi Kenyalang). Living up to the state’s coat of arm, a hornbill birds, land of Sarawak clearly filled with unique eco-life, unique culture heritage and lush greenery. Prepare to amaze by the star attraction of national park – the spectacular Rafflesia flower. Crowned the world’s largest flower, Rafflesia much of the biology remains mysteries as it has no roots, steam and leaves. Explore the 5 to 7 species of huge, leathery and five-petalled flower Rafflesia only in one place this coming November to February (Wetter Month). Plan for the trip and secure a rental car to travel there. 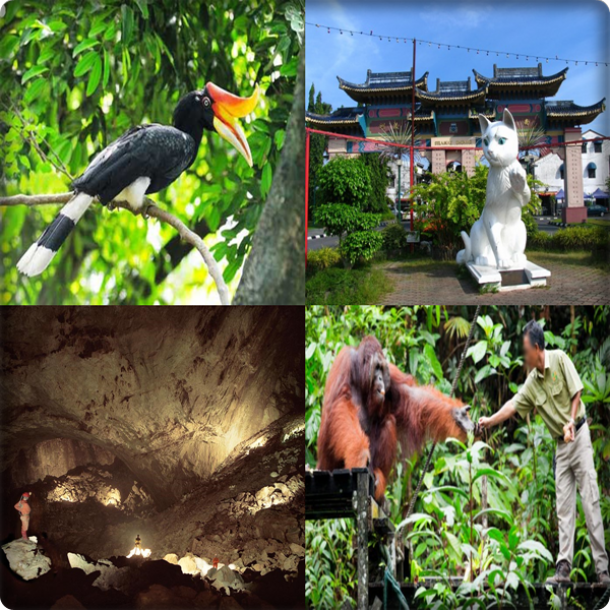 Witness the spectacular scenery and biological significance of world heritage caves and tropical forest park. Walk down the world largest cave passage –Sarawak Chamber to study theories on natural karst and faunas. Orangutans Sanctuary! Semenggoh Nature Reserve is one of the best places to see orangutans (A species of extant great apes) in their nature jungle habitat. Watch and capture the moment of orangutans swing from trees and dashing with vines. Chance of these tree-dwelling orangutans shown up is excellence on fruity season, which are December to February! Visit them with family this coming year end holiday. Authentic longhouse from Sarawak native, which you can learn the culture and tradition of local tribe Bidayuh! With just walking distance from Semenggoh Nature Reserve, package available for you to visit wildlife than living under one roof with native friends to experience their way of traditional living. Join and cerebrate Gawai (Crebration to please paddy spirit for good harvest) in June. Or simply enjoy their heritage musical, campfire at night and camping at the site. Kuching, literary mean Cat in Malaysia language. For cats lover and cats lover-to-be out there, the perfect place to take photo on cats exhibits, photos, feline arts, organized display of statue and doll. Study the history and detailed research about cats. Bring back cats related souvenir, that only available in this museum! Located around the Kuching City, Cat Museum is only 20min from Kuching international Airport by rental car. Top destination for local cafes and souvenir in Kuching! Kuching Esplanade, located near the beautiful Sarawak River, simply dine in eastern heritage style cafes. Main Bazaar the heart of old Kuching, you can easily find millions type of ethnic handcraft and antique that work best for souvenir! From statue, shirts, keychain to local food like Kuih Lapis (Layer Cake) and Sarawak fragrance (Pepper, Curry). Located at Kuching City Centre, drop by to enjoy local food, buy souvenir and take a selfie before head over to Kuching International Airport to end your wonderful journeys. “Car like” [adjective] – a word used to describe characteristics or features that resemble those found on or in a car. To add to that, it is also a word that is most commonly used by motoring scribes on every 21st century four-wheeled motor vehicle from SUVs and pick-up trucks. It is only in recent times that this odd fascination for having “car like” traits and things, popped up in the market. Back then people called a spade a spade, and liked it that way. Nowadays you are never too far from a big and imposing SUV that can outrun a sports car and corner on rails, or more prevalently, pick-up trucks with all the gadgets and appointments of a car. Most pick-up trucks in the market today are well-appointed luxury barges when you consider how crude and simple they used to be at the turn of the 1990s. That said, for all these lovely lashings like multimedia entertainment systems, sound proofing, or a decent ride comfort that we can now enjoy on today’s pick-up trucks, the question has to asked if they are still the tough and dependable machines that they were made to be? Cars are nice and comfy, but they are weak and hopeless where roads are absent. The truest test of a pick-up truck is to send it to where the roads are as unforgiving as the jungles around it, and that is why we are here driving Isuzu’s new D-Max through the jungles of Sabah. If you haven’t been to Sabah, you should. It is a magnificent and beautiful place that is largely untouched by the march of progress. Word of caution though, it is not suited for cars as the road network isn’t so much as being poorly maintained, but sporadic. Some stretches of roads are well built, laid with smooth tarmac and properly cambered, only for it to end abruptly and become a gravel track before you know it. And that is if you are lucky. Some sections there really isn’t any road at all. To get around Sabah, a pick-up truck is a necessity, but can the pick-up trucks of today survive the trials of off-road driving, or has it been soften by the demands of modernity? With that in mind, Isuzu Malaysia prepared their most powerful D-Max model, the V-Cross 3.0L, which we would be driving on a 560km Dura-Mission expedition around Sabah. The trip would take us from the state capital, Kota Kinabalu, up to the northern most point of the island, the Tip of Borneo, down to the mountain town of Kundasang, and right back to the capital. For those who aren’t familiar with the 3-litre variant of the D-Max, here is a brief rundown of what it has in store. Considering that the route would take us on mountain roads and through muddy jungle paths, our D-Max was outfitted with chunky Viking off-road tyres, and large side steps to make it easier for us to get in and out of it. It might not sound like much but tyres do make a lot of difference in a vehicle’s performance, and a necessity considering how far deep into the jungle we would be driving the D-Max into. As the D-Max now comes with a larger cargo bed behind, its rear overhang has grown substantially, and to help it climb any steep inclines, Isuzu Malaysia has taken off the rear bumpers as well. Apart from those modifications, the D-Max is similar to the D-Max you can buy straight off the showroom floor, same drivetrain and stock standard features inside. On paper the D-Max’s 3-litre 177PS turbocharged diesel engine sounds immense, but its power delivery doesn’t feel like a handful when you pin the throttle. Even though it has 380Nm on the cards, which is dealt out from 1,800rpm, the D-Max doesn’t accelerate off the line with any sort of urge. The power ramps up gradually rather than immediately. Despite its displacement, the 3-litre engine doesn’t feel all that more powerful from the more affordable and slightly less powerful 136PS/320Nm 2.5-litre variants. Though as it turns out, on some Sabah’s more mountainous roads and challenging terrain, the extra grunt to be had from its 3-litre engine does allow the D-Max to pull itself through sticky situations with better ease, which was a good thing as rain and mud were in no short supply on the day that we left Kota Kinabalu. With heavy skies overhead, the weather was a full-on deluge, but that was of little consequence as all was well inside the D-Max. For a pick-up truck, the cabin is refinedand well-equipped with a whole host of features such as auto climate control, multimedia features, and even Bluetooth connectivity. And yet, as befitting of its kind,there is a robust feeling that it will withstand hard usage and wear its years well. Given its body-on-frame construction and leaf springs, it delivered a rather comfortable ride on the road, though that said, there was a huge amount of tyre roar from the off-road tyres, and around corners the huge tyre threads doesn’t offer much in the way of cornering stability. Nevertheless, on the road the D-Max had decent handling characteristics, not quite as sporty as the likes of the Mitsubishi Triton, but its road-holding qualities and ride comfort is good enough that any standard car driver wouldn’t feel too alienated when helming it. It is big on the outside, but behind the wheel the D-Max is easy to drive and thread through the narrow village roads. But we didn’t travel over the South China Sea to assess the its on-road credentials, nor are we here for the roads, even though Sabah is home to some of the best roads in the country, like the majestic A150 highway that snakealong the Crocker mountain range. 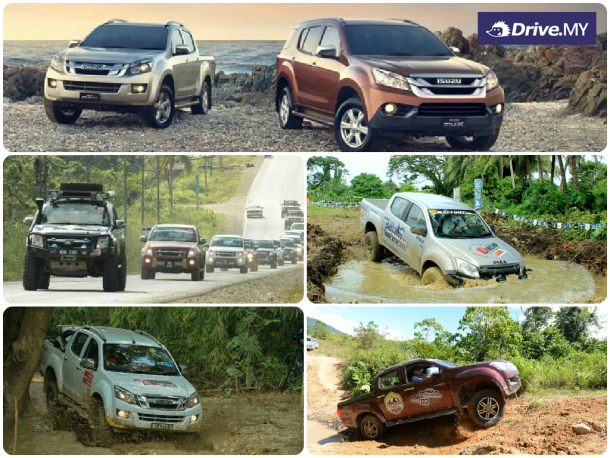 Instead we are here to get down and dirty off the beaten path with the D-Max, and in Sabah, you won’t have to travel far to find it. Just 30km out of Kota Kinabalu and we divert ourselves from the smooth hillside roads and straight onto a muddy trail that leads into the deep end of the jungle. Though weighing nearly two and a half tonnes, it is remarkable to note that the D-Max is quite capable off road without having to resort to using its two 4WD modes. Its dirt crawling capability is of course helped by the off-road tyres, which can vastly alter its performance on rough terrain. As a general rule, if the trail you are on comprises of tarmac, gravel, or stable sand, even with a slight incline, you would be fine driving around in 2WD mode. It is only when the ground beneath is soft sand or thick mud that its 4WD mode is required as the rear wheels can easily sink into the soil, or the torque from the engine dig the rear wheels into trouble. With power distributed between the two axles, it is easy for the truck to pull itself out of a bind, unless of course there isn’t enough torque from the engine to overcome the terrain. For that you need to resort to the last setting, 4WD low-range. “4L” mode on the D-Max is only reserved for the most challenging conditions, such as rocks and steep unstable terrain. In this mode, power is transferred to all four wheels through a low-range gearbox, which enables you to rev the engine without having to build up speed. This would be useful to get bursts of torque from the engine to steadily pull yourself out of situations, as well as induce engine braking to keep your speed under control when descending steep and slippery slopes. Through the pouring rain, muddy slopes, rocky escarpments, flooded rivers, and sweltering swamps, the D-Max performed flawlessly. The only moments where I found myself stuck were due to my own lack of experience in off-road driving. For most parts then the D-Max is well suited for off-road excursions and life away from the comforts and confines of the road. Despite improving the interior refinement and making it all “car-like”, the D-Max is no less tough and dependable as its predecessors were. The extended load bed behind has also increased the D-Max’s carrying capacity by a huge degree as compared to its predecessor, making it just as big as the load beds you find on its contemporaries today. On top of that, Isuzu has certainly upheld the D-Max’s reputation for fuel efficiency with this generation. After 560km worth of fast on- and tough off-road driving, the D-Max with its 3-litre turbodiesel engine returned a fuel consumption figure of 10L/100km, which is a remarkable figure for an engine of such displacement. Though Isuzu only produces two passenger vehicles in their model line-up (with the MU7 seven-seater SUV based on the D-Max slated to be introduced in Malaysia later this year) the Japanese company’s primary business is engineering and supplying diesel engines for other clients, and that shows in the D-Max. For its smoothness, power delivery, and fuel efficiency, the D-Max’s engine is a fine example of their engineering expertise. Although the D-Max has adopted more “car-like” qualities, it hasn’t forgotten that the great majority of pick-up truck buyers aren’t easily swayed by what is fancy and snazzy. Despite the praise these new car-like pick-up trucks have been receiving, and the laurels that have heaped upon their shoulders, the best selling pick-up truck in the country is still the relatively simple and crude Toyota Hilux. So all things considered then the D-Max truly excels at being an all-round competent truck that brings together the “car-like” qualities that many desire, but keeps its low ownership costs and robustness that everyone needs. And in our vocabulary, that is what we would call a “win-win” scenario. Planning for a short trip to in the weekends?? Don’t worry, book a car with Drive.MY and drive across to JB. There are ample of lovely places to be visited in JB. Make sure take this as a check list on PLACES TO GO in JB. 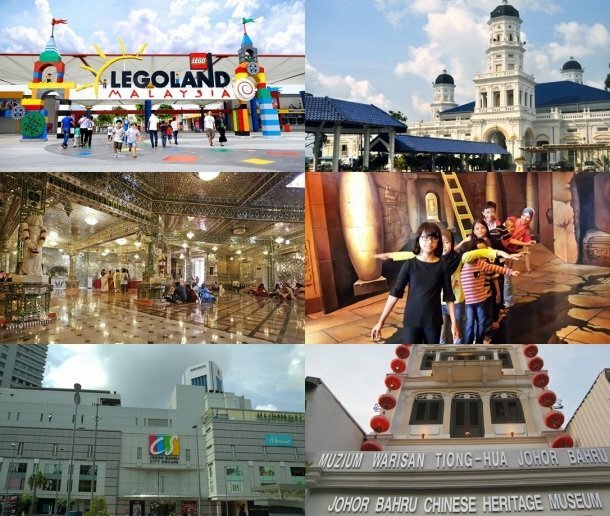 LEGOLAND® Malaysia Resort brings together a LEGOLAND Park, Water Park and Hotel in one LEGO® themed location. It is a family holiday destination with more than 70 hands-on rides, slides, shows and attractions. Almost everything is hands-on, so you can push, pedal and program, or steer, squirt and splash, your way through a truly interactive experience and of course there’s building too. The Sultan Abu Bakar State Mosque is located along a street name Jalan Skudai. The Sultan Abu Bakar State Mosque was completed in the year of 1900 The architecture of the mosque is a mix of two distinguishable styles. They are Victorian and Moorish styles with a little influence of Malay style. Non - Muslims are allowed to enter the mosque. However, decent and modest clothing must be worn as a sign of respect. Besides, one must remove his/her shoes before entering the mosque. The nearest Johor hotels to the state mosque are Thistle Hotel, Puteri Pacific Hotel and Citrus Johor Bahru. Arulmigu Sri Raja Kaliamman Temple is one of the oldest temple in Johor Bahru. The temple was listed in the Malaysian Book of Records as the first and only glass temple in the nation on May 12, 2010. Light from crystal chandeliers is reflected on doors, pillars, walls and ceilings in a bright blaze that’s quite blinding initially. At least 90 per cent of the temple is embellished by a mosaic of 300,000 pieces of red, blue, yellow, green, purple and white glass. The centrepiece in the Athma Lingam sanctuary is a lotus for Lord Shiva, on which devotees can pour rose water and perform their prayers. Guru says this special sanctuary is the first in Malaysia to be designed with walls that are fully covered with 300,000 mukni Rudraksha beads from Nepal. At a glance, the walls appear to have an unusual embossed texture. Each Rudraksha bead is embedded in the walls with a chanted prayer. The fully air-conditioned temple has a café that serves vegetarian meals for special events, and a function hall in an adjoining building. It was subsist since the year 1922 on the land is given to the Indians by Johor Sultan. This temple is located at No. 22, Lorong satu, Jalan Tebrau , 80100 Johor Bahru. It is nearly 2 km drive from Johor Bahru Town. For the ultimate family fun experience, visit Kuso 3D Trick Art and prepare yourself to be amazed and entertained while you laugh the day away! Kuso Trick Art Gallery are the first destination for 3D trick art in Johor Bahru and Kuso Trick Art Gallery are undoubtedly the best venue for fun and exciting experience. Kuso Trick Art Gallery unique 3D paintings and interactive sessions offer something for everyone. From couples and families, to schools, sports teams and corporate events; Kuso 3D Trick Art will bring joy and happiness to your day. Kuso Trick Art Gallery are also great for any organizations’ team bonding activities and can create personalized packages to suit your needs and the needs of your business. It’s located at 83 & 85 Jalan Mutiara Emas 10/2, Taman Mount Austin, 81100 Johor Bahru, Johor, Malaysia. A place where fun is assured! Strategically located in the heart of the city and only a stone’s throw from the customs and immigration checkpoint, Johor Bahru City Square stands out as a central landmark in JB. Due in part to its proximity to the Johor-Singapore Causeway, City Square attracts many shoppers from Singapore. With its more than 200 retailers, it offers a host of fashion, entertainment and restaurants. All catered to wow the senses and satisfy the needs. Rush in when the doors open at 10a.m for breakfast, then head out and start your shopping adventure of clothes, shoes, bags, toiletries, electronic toys. Everything the heart desires. Unique to Johor Bahru City Square is the Inner City, an eclectic mix of smallish fashion and accessory shops plus restaurants housed in a tight, quaint setting. Always a firm favorite of the “NOW” generation. After many hours of shopping, rest the feet in one of the numerous restaurants and cafes or indulge in a soothing foot massage, then go on to treat the rest of the body at a salon. A walk along Jalan Tan Hiok Nee in Johor Baru will take you pass charming coffee shops, old provision stores, and a traditional charcoal bakery and on to OCBC Bank - the bank that catered to Johor's pioneer overseas Chinese. It also leads to the rear entrance of the Johor Baru Chinese Heritage Museum, a four-level building that can be accessed from two entrances, Jalan Ibrahim and Jalan Tan Hiok Nee. This building, occupied by the Johor Baru Tiong-Hua Association since 1948, was officially opened as a heritage museum in October 2009. A visit to the museum is an enriching experience, not only for those who wish to learn more about the culture and heritage of their forefathers and early Chinese immigrants in Johor but, also for anyone who is keen on history. 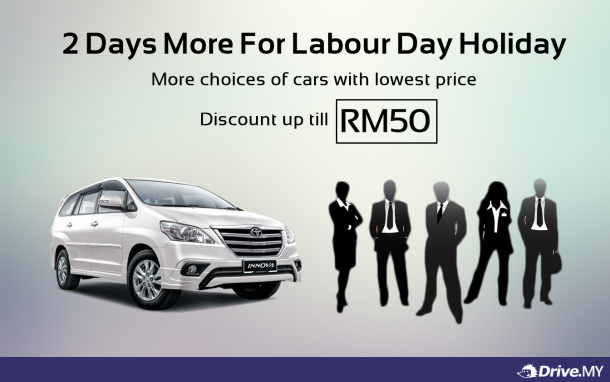 With this great places to visit in JB, Rent a car from Drive.MY and have a splendid time with family and friends, guarantee it will be a worthy visit. Plan this weekend wisely.